Safely and easily remove contamination from your paint! The Rag Company Car Wash Microfiber Terry Towel Light Blue will help you safely remove contamination from your car during the wash process! Wash mitts, sponges, pads, etc. 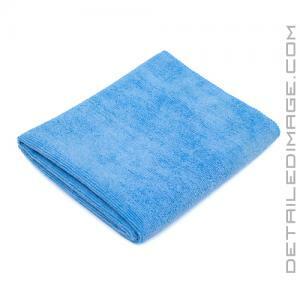 there are so many options for wash media that we often times overlook old faithful, the microfiber towel! The Car Wash Terry Towel measures 16" x 27" and has an overlocked stitched edge with round corners. This large, high-quality construction increases overall durability during the wash process so you'll have this towel for years to come. With such a large towel you can constantly expose a fresh and clean surface to the paint to minimize the chance of marring the paint. The 320gsm allows the towel to glide across the surface and the microfiber stands pull dirt, grime and other contamination from the paint. This ensures safe and efficient cleaning, while reducing the risk of adding ugly wash imperfections into the surface. If you are looking for a high-quality microfiber towel to wash your vehicle, reach for the Rag Company Car Wash Microfiber Terry Towel Light Blue!